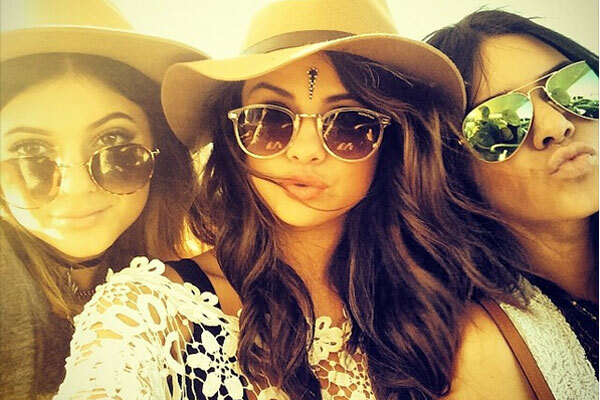 Today, we are going to see best celebrity Coachella style looks captured during the festival days. Of course, Coachella is an awesome event with great music, but it's also a place where ladies appear in stunning, fun and creative outfits. It's a real "fashion festival" obsession! You can see crochet dresses, flirty rompers, floral frocks, boho separates, denim, cool cut-offs, etc. Anyway, here is a look at the best outfits captured from Coachella. Kendall Jenner appears in long-sleeve white crop top and monochrome printed trousers. Ashley Benson looks like a punk tomboy. Vanessa Hudgens looks like a real boho chic in this maxi printed gown. Selena Gomez with Kylie & Kendall Jenner. Lily Collins appears like a sweet girl wearing this lightweight dress. Ellie Goulding loves boyfriend style. Vanessa Hudgens looks like a bohemian lover. Bella Thorne looks hippie inspired wearing a fringed suede brown bikini top and tribal print shorts. Lucy Hale appears in a floral playsuit. Love her chunky accessories. Emma Watson in tiger print strapless playsuit, shortened black knit cardigan and wide brim floppy hat. Emmy Rossum in airy semi-sheer maxi gown styled with shortened denim jacket. AnnaSophia Robb looks like a flower girl in this multi-striped summer dress. Love the flower headband. Victoria Justice (with Cody Simpson) wearing a salmon pink lace top and white mini shorts. Sarah Hyland looks awesome wearing a cape-poncho atop shortened tops styled with denim cut-offs and chunky flat black booties. Love the heart-shaped sunglasses. Love these floral mini shorts worn by Emma Roberts. Kendall Jenner appears in a totally black outfit. Love this lace semi-sheer maxi robe. Kylie Jenner appears like a Goth queen wearing a cropped black lace top and matching mini shorts. Ashley Benson and Troian Bellisario. Semi sheer shirt and khaki vest look ideal.